Situated in tranquil garden surroundings, conveniently located near to the Bryanston Shopping Centre. 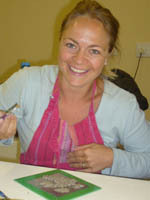 Classes provided for Adults on weekdaymornings from 9.30am to 12.30pm. Wheelchair access. Secure parking. As our lives get more frenetic, so we search for new ways to relax and spend quality time with our inner-selves. This is where pottery can be the answer. 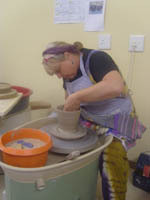 The Pottery Studio in Bryanston is an informal group of dedicated and passionate studio potters; Colleen Lehmkuhl and Nic Sithole, with specialised ceramic workshops presented on a regular basis by well known Ceramists John Shirley, Michelle Legg, Karen Murry and Drury Brandt. We are finding that most people who come to our studio are looking for a few hours where they can relax, just be themselves, meet new people and make beautiful things. Working with clay is therapeutic. Not only is the process enriching, taking home a beautiful hand-made piece is enormously gratifying. Pottery is for every age and every walk of life. 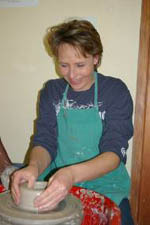 All levels of experience are welcome to attend classes and workshops. 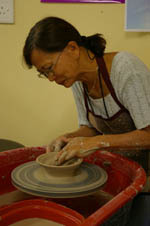 Beginners can look forward to exploring various clay forming techniques such as pinch pots, coil building, slab building and throwing on the wheel. 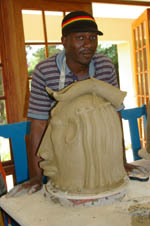 Basics of clay and glaze composition will be discussed throughout the classes in a relaxed and informal manner. 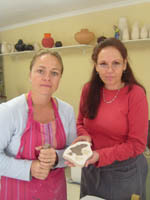 All aspects of the formation process will be explained so as to have a full understanding of the entire ceramic process. Students will be encouraged to draw inspiration for their work from their own personal accounts of the world around them. Once the student is comfortable with the medium, individual projects are encouraged that may be initiated by the student or teacher. Each student works at their own pace and individuality and originality are encouraged. Rather than have your next teambuilding be a test of strength, how about a test of style and colour? 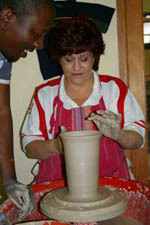 Experiential pottery is not only unusual but also very therapeutic and bound to get everyone talking around the table. Few of us are free of stress; even the good kind that drives us to success still takes a toll on our shoulders and neck, on our tempers and our health. 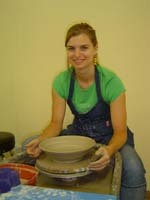 Colleen is an art college qualified teacher who wants to share the well-being that pottery offers not only to conventional potters but also to people who would never have considered it as a fun activity. ‘Having worked at IBM for 22 years before opening my own studio, I can relate to the pressures of working in the corporate environment’. “The team building lasts for three to four hours that either starts with or ends with lunch. 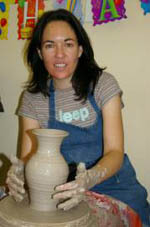 Charlotte Middleton, qualified workshop facilitator, introduces the team members to an interesting, brief background of pottery and ceramics, and this is followed by painting the bisque ware. 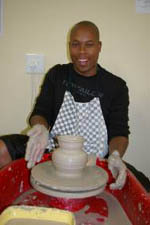 Then one by one, they are introduced to the potter’s wheels, ably looked after by Nic Sithole, who has 28 years of throwing experience and a calm way of explaining the techniques. “The excitement of each person as they discover that they too can change a lump of clay into a beautiful shape is very contagious and, after the first person has tried, there is an eager queue waiting to recapture lost childhood memories of making things from mud and plasticine. “The other thing that makes this so suitable for team building is that there is no competition or error. If it goes wrong, you start again – that’s the beauty of clay – it’s a kind of magic where a lump of clay becomes a solid dream,” concludes Colleen. Colleen’s studio is custom built and sun-drenched in the leafy suburb of Bryanston and can handle up to 24 people at one session. Catering can be provided or the clients can bring in their own caterers. Coffee and tea are always available. Studio 24 Old Kilcullen Road, Bryanston.